(Bloomberg) -- U.S. equity valuations have become too stretched after the recent rally and that is opening up opportunities in other stock markets, according to AllianceBernstein LP. The S&P 500 Index has risen 12 percent in 2019, just days away from its best quarter since 2012. 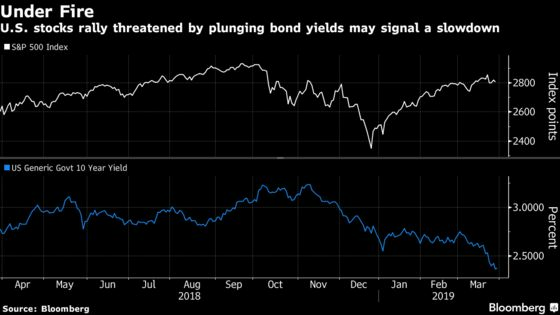 At the same time, Japanese stocks are headed for the first monthly loss this year as the sharp decline in developed-market sovereign bond yields escalates concerns surrounding global economic growth. Ultimately, markets are more concerned about the shift in the global trade landscape, said Bernstein, who joined the money manager with about $547 billion in assets in a shakeup in 2017 after a 32-year career at JPMorgan Chase & Co.
“What I think the market is increasingly worried about are macro events, which are less about the longer-term cycles of economic expansion and contraction and more concerned about the ongoing transition of the global trade framework,’’ Bernstein said. The Federal Reserve is done with raising interest rates, though the authority won’t be cutting them this year because the U.S. is not yet going into a recession, he said.